She came here to find hope. 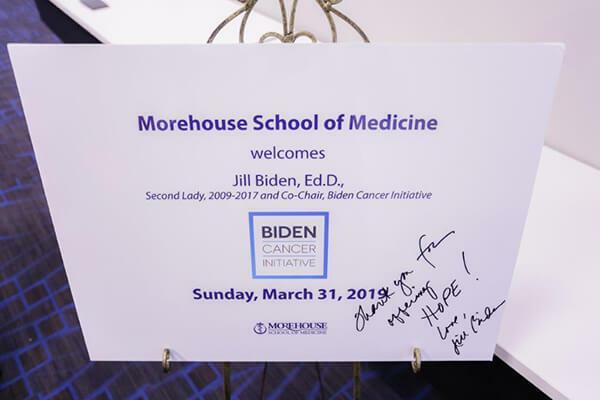 That’s what Jill Biden, Ed.D., co-chair of the Biden Cancer Initiative was looking for during her visit to Morehouse School of Medicine on Sunday, March 31. 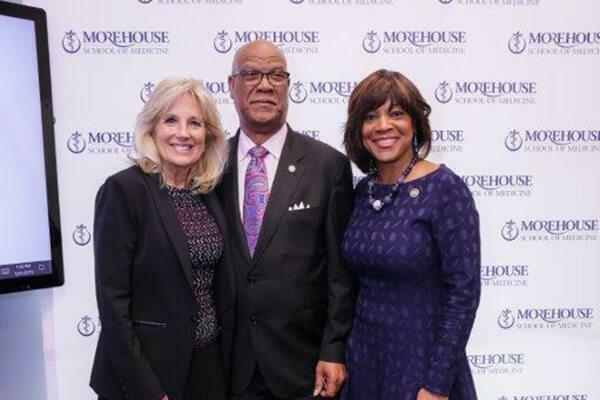 Hope for patients battling cancer. 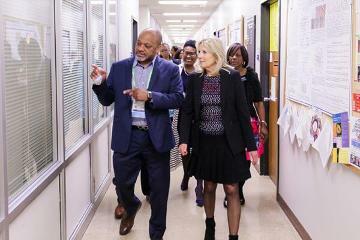 Hope for increasing early detection rates and prevention. Hope for a cure. 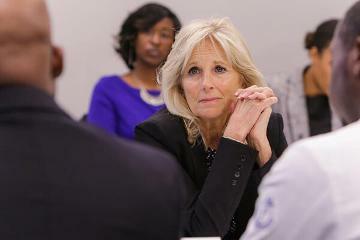 Dr. Biden and her husband former U.S. Vice President Joe Biden launched their Initiative after losing their son Beau to brain cancer in 2015. 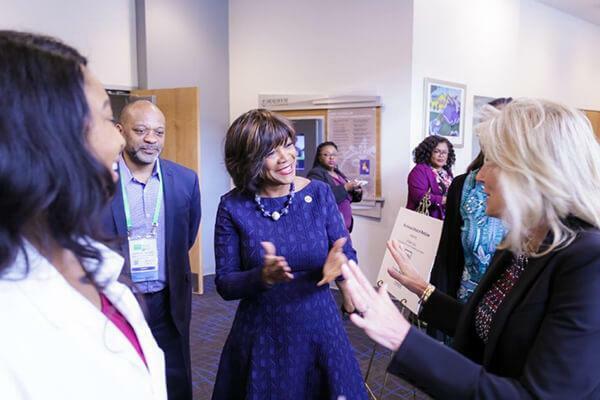 She came to MSM to see how the medical school is working to fight the disease and meet future health leaders preparing to take on that battle. After learning more about the school’s mission from President and Dean Valerie Montgomery Rice, M.D. 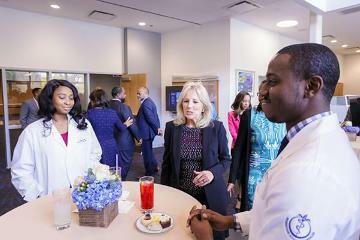 and about the Cancer Health Equity Institute from Brian Rivers, Ph.D., Dr. Biden had a chance to hear from students. Like Dr. Biden, many of them watched a loved one suffer from the disease, leading them to pursue careers in medicine. Ian Saunders lost his grandmother to renal cancer when he was just nine years old. Her doctors did not catch the cancer until it was too late. Losing his grandmother triggered Saunders’ desire to study cancer, specifically colon cancer. He is now studying to see if an extract from the rhubarb plant can be used to treat patients. So far, he has seen promising results and is now looking at the next steps. Saunders is expected to graduate with his Ph.D. in December. 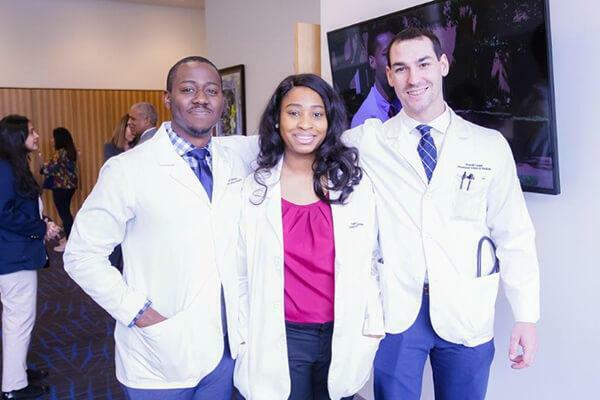 Second-year Master of Public Health student Astra Watts’ research will hopefully save her life. 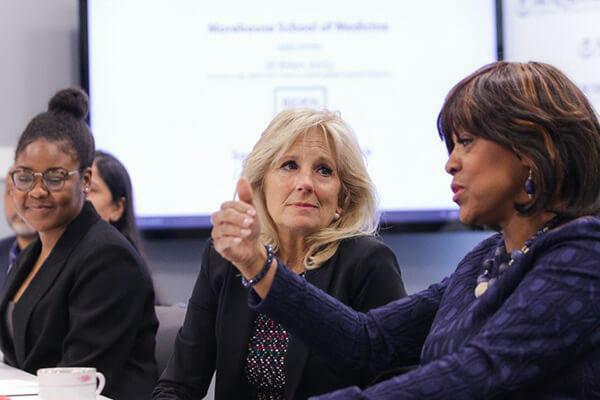 She shared with Dr. Biden how she had an interest in breast cancer and chose to study it. Watts’ findings made her look at her own symptoms and lifestyle and requested a mammogram from her doctor. She was diagnosed with breast cancer at just 24 years old. 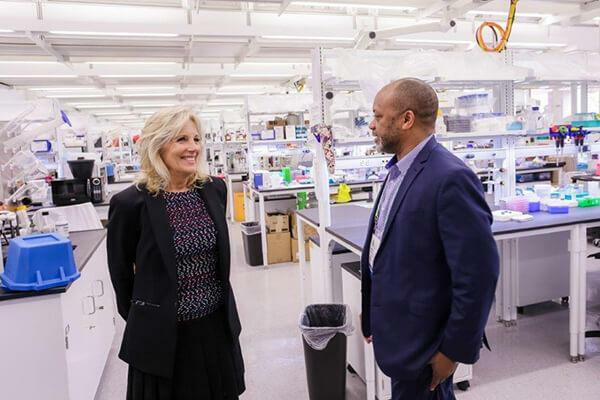 Dr. Biden got a chance to explore the lab facilities on campus and check out some of the school’s recent renovation projects. She was impressed by what she saw, leaving the campus confident that MSM students were on the path to being leaders in the fields of cancer care, prevention, and research. 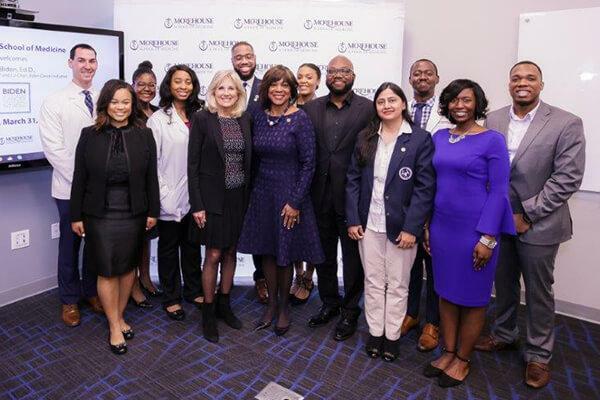 “You saw just how incredible they were and their research, and the different things that they’re interested in,” Dr. Biden said with her voice overflowing with enthusiasm. 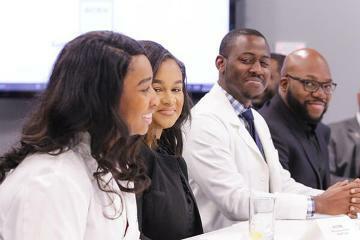 “The subjects that they have chosen, the psychological effects of cancer. Each one had something specific that he or she wanted to focus on. 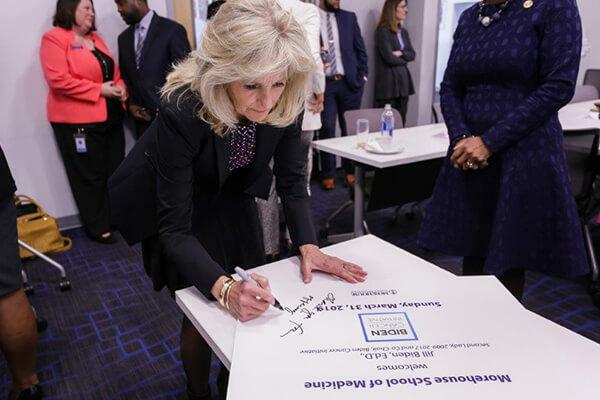 Before leaving the West End campus, Dr. Biden signed one of the posters welcoming her to campus, leaving behind a special message to the MSM community.